They couldn’t hurt Aaron anymore, but he couldn’t move on. He lingered, watching over the weak, visiting his mourning family. There would always be victims; Aaron knew this. As long as the gym teachers and cafeteria monitors conveniently turned their backs on what they were well aware of was happening; the abuse of the vulnerable would never end. Julie A. Dickson is a poet and writer living in New Hampshire. 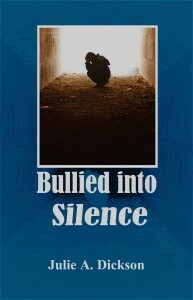 She writes firsthand on the issues of bullying that she experienced and witnessed during her school-aged years, in the hope that victims can be supported and helped. Dickson writes poetry as well as fiction and non-fiction for young adults, often exploring sensitive teen issues. Her poetry has appeared in The Harvard Press, The Poet’s Touchstone, The Avocet, Page and Spine, Foster’s, and the Portsmouth Herald. She is an active member in the Poetry Society of New Hampshire, The Hyla Brook Poets at the Robert Frost Farm, and participates in many area poetry workshops, including Writers in the Round on Star Island.